Fujitsu Announces New Highly Integrated WiMAX SoC, Assumes Industry Leadership in IEEE 802.16 Technology | SPARC International, Inc.
Fujitsu Microelectronics America, Inc. (FMA) today introduced its highly integrated WiMAX system-on-chip, the MB87M3400, which complies with the IEEE802.16-2004 standard and will enable development of a new generation of WiMAX-compliant broadband wireless access (BWA) equipment. The Fujitsu WiMAX SoC sets the stage for both base station and subscriber station implementation, which will bring cost-efficient, high-quality, fixed broadband connectivity to Metro Area Network users, without the need for direct Line of Sight access to base stations from their remotely connected subscriber stations. The MB87M3400 is designed to enable deployment of BWA equipment for both base stations and subscriber stations in licensed or license-exempt bands below 11GHz. The MB87M3400 uses an OFDM 256 (Orthogonal Frequency Division Multiplexing) PHY that supports channels from 1.75MHz up to 20MHz, and can operate in TDD or FDD modes, with support for all available channel bandwidths. A programmable frequency selection generates the sample clock for any desired bandwidth. When applying 64QAM modulation in a 20MHz channel and using all 192 sub-carriers, the SoC’s data rate can go up to 75Mbps. Uplink sub-channelization is also supported. The Fujitsu WiMAX SoC incorporates sophisticated processing power, including a powerful main RISC engine that implements the 802.16 upper-layer MAC, scheduler, drivers, protocol stacks, and user application software. 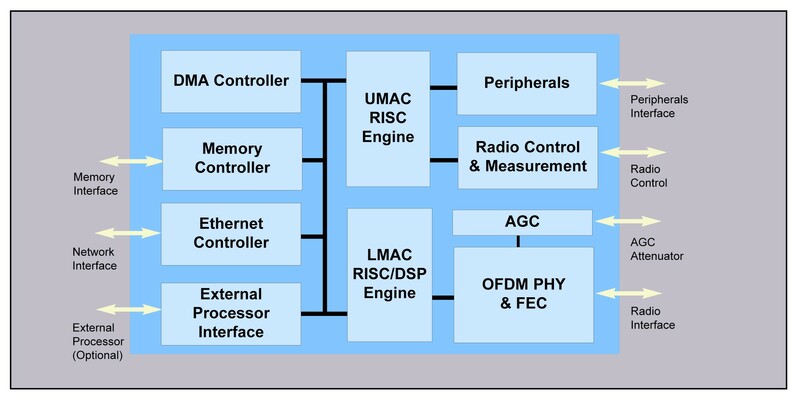 Also on board is a secondary RISC/DSP that functions as a co-processor, which executes lower-layer MAC functions, offloading processing from the upper-layer MAC and enhancing total performance. A multi-channel DMA controller handles high-speed transactions among agents on a high-performance bus. The Fujitsu WiMAX SoC also incorporates radio control and all required analog circuits, along with a comprehensive set of integrated peripheral functions. To ensure security, the MB87M3400 uses DES/AES/CCM encryption/decryption engines for the 802.16 MAC privacy sub-layer. The chip also includes a memory controller, an Ethernet engine for interfacing to the network, and high-performance DAC/ADC for flexible baseband interface. 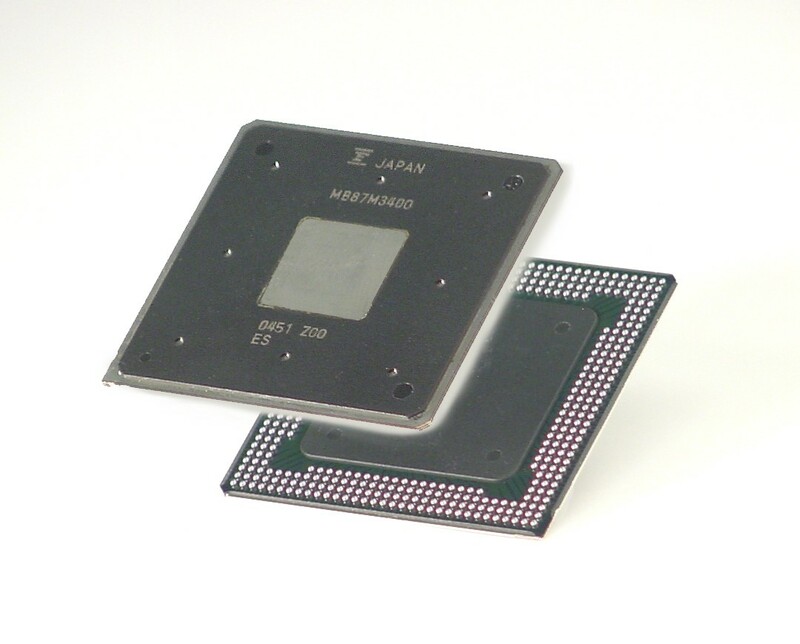 The MB87M3400 comes in a 436-pin BGA package and is now available. The price begins at $45 each in 1,000-unit volumes. A complete reference design, including all required software and hardware for a cost-effective system solution, is also available. The reference design is scheduled for certification by the WiMAX Forum™. Fujitsu plans ongoing, comprehensive support for the WiMAX standards, as the WiMAX Forum and its member companies work to deliver IEEE 802.16e to serve mobile wireless broadband applications. About Fujitsu Microelectronics America, Inc.